Submitted photo By virtue of her bronze-medal finish at the Pan American Race Walking Championships last May in Lima, Peru, Beavercreek’s Susan Randall (far right) had qualified for the women’s 50-kilometer race walking championships to be held Aug. 13-14 in London. 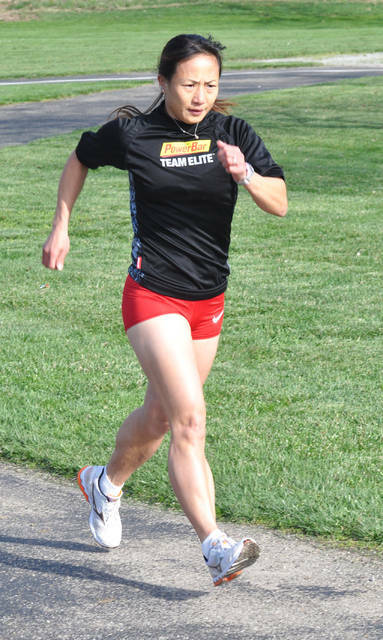 File photo Susan Randall, shown here training at a Beavercreek area park, had to file a lawsuit with the International Association of Athletics Federations (IAAF) to earn her rightful place in next month’s 50-Kilometer World Race Walking Championships. BEAVERCREEK — With the help of a San Francisco attorney and the USA Track & Field sanctioning body, Beavercreek’s Susan Randall will get her shot at competing for a world title. Randall, one of the world’s best race walkers in her age group, thought she’d qualified for the 50-Kilometer World Race Walking Championships, set for Aug. 13 in London, when she finished third at the Pan American Race Walking Championships last May in Lima, Peru. Her third-place finish earned her the title of North American Central American Caribbean area champion. One of the World Championship’s entry criteria is that an athlete who is ruled an area champion, regardless of the time they post, will be eligible for the World Championship race. But when the USATF submitted Randall’s entry to the IAAF, her entry had been refused. That’s when San Francisco attorney Paul F. DeMeester got involved. DeMeester took Randall’s case to the Court of Arbitration for Sport in Switzerland. According to Randall’s husband, Mike, the IAAF settled her suit against them earlier this week. “Susan leaves Monday after suing the IAAF for entry (into) the World Championships, in the first-ever Women’s 50K world championship,” Mike Randall said in an email on Friday, July 28. According to DeMeester, the IAAF set the qualifying standard at 4 hours, 30 minutes for the London Women’s 50K (31.069 miles) World Championship event just last week. Using that standard, five athletes — world record holder Ines Henriques of Portugal, Han Yin of China, Kathleen Burnett of the United States, Shuqing Yank of China, and Erin Talcott of the U.S. — qualified. But the IAAF’s rules allow for any Area Champion, regardless of their finishing time, to have reached the entry standard as well. At the Lima, Peru race, Randall, 43, was the North American Central American Caribbean area champion for her age group. Brazilian Nair Da Rosa, the winner of the Lima race walk, also qualified for the World Championships as the South American champ. Randall currently has the 15th quickest 50-kilometer time in the world at 4:54.12. The USATF has her all-time best 50K race walk time listed as 4:42.34 set at a USATF-sanctioned event in 2014 in Santee, Calif.
DeMeester noted that the IAAF was allowing South African male 10,000-meter runner Stephan Mokoka to compete in the 10,000-meter championships by virtue of his Area Championship, even though Mokoka did not meet the qualifying time standard for his event. He just wanted Randall and Da Rosa to be held to the same standard. According to DeMeester, the IAAF had previously required women athletes to meet the men’s standards in order to qualify for the 50-Kilometer race walk championships. This is the first year that the IAAF will host a women’s 50K race walk world championship. The women’s world record in the 50K racewalk, a time of 4:08.26 set by Henriques on Jan. 15, is still 2 minutes and 30 seconds slower than the men’s 50K racewalk entry standard. 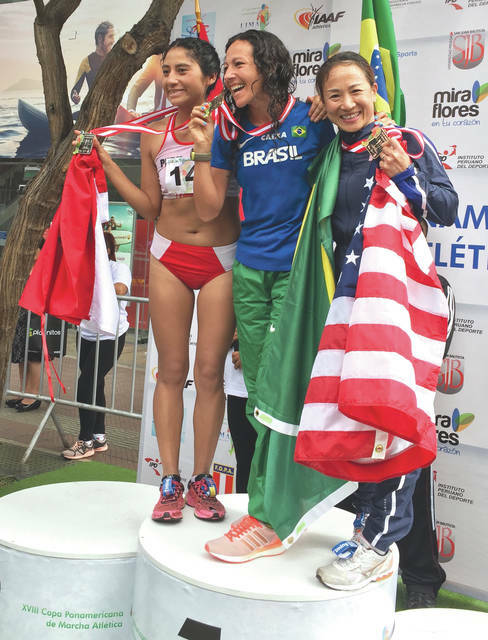 https://www.beavercreeknewscurrent.com/wp-content/uploads/sites/49/2017/05/web1_RandallPeru_PS.jpgSubmitted photo By virtue of her bronze-medal finish at the Pan American Race Walking Championships last May in Lima, Peru, Beavercreek’s Susan Randall (far right) had qualified for the women’s 50-kilometer race walking championships to be held Aug. 13-14 in London. https://www.beavercreeknewscurrent.com/wp-content/uploads/sites/49/2017/08/web1_RandallTeaser_PS.jpgFile photo Susan Randall, shown here training at a Beavercreek area park, had to file a lawsuit with the International Association of Athletics Federations (IAAF) to earn her rightful place in next month’s 50-Kilometer World Race Walking Championships.